Start by making the thyme crumbs: heat oil in a frying pan over medium-high heat, add garlic and sauté until fragrant (1 minute). Add breadcrumbs, sauté until golden (2-3 minutes), add lemon and thyme, season with salt and pepper, remove from heat and set aside. Pasta and sauce: cook pasta in a large saucepan of boiling salted water until al dente (6-8 minutes) – while the pasta cooks, make the sauce: heat oil in a saucepan over medium-high heat, add onion and garlic and sauté until tender (2-3 minutes). Add wine, lemon zest and juice, simmer until reduced by half (2-3 minutes). Add cream, simmer until reduced by half (2-3 minutes), then add provolone and thyme, stir until smooth and combined (1-2 minutes), season with salt and pepper and keep warm. Drain the pasta, reserving ¼ cup (60ml) of the cooking water. Return pasta to the saucepan and add the cream sauce, stirring to coat. Add a little of the cooking water to loosen up the sauce (you might not need all the water). Serve hot, topped with lemon and thyme crumbs. Delicious. 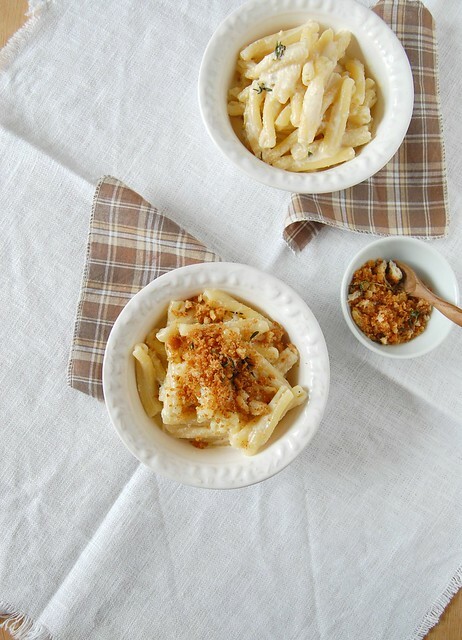 An elegant mac and cheese! How scrumptious, I love the crumb topping! This looks so delicious! I love lemon in savory dishes, especially when cheese is involved. This looks perfect. Italian gentleman who served me talked to me about Brazilans and provolone. Anyway, I digress. I can nearly see the smile on your face when preparing this dish with these ingredients that make your heart beat fast. The alchemy seems spot on.